The Stand Alone is the Luma Bar® product that revolutionized compartment lighting. The compact, low-profile design creates an unobtrusive, space-saving light that can be mounted just about anywhere that lighting is required. Incorporating the Luma Bar® patented variable aiming system, additional lighting can be conveniently provided wherever you need it most. 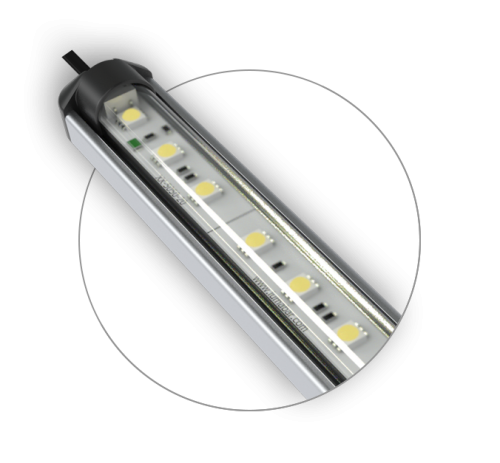 Supplied with a full-length aluminum mounting extrusion and encased in a high-impact polycarbonate lens, this waterproof, IP67 rated, LED light is a durable product that can provide many years of use, even in the most demanding of situations. Standard lengths are available, as well as custom lengths, to suit any interior application. In addition to the standard clear white lens, red and blue lenses are also available. Alternatively, the Standalone can be ordered as a combination of red and white or blue and white lenses. Also included is the Luma Bar® current limiting device, which will shut off in the event of an electrical surge, and then resume once normal operating conditions are met. Both 12v and 24v models are available. Ideal for truck compartment lighting, vehicle interiors, tool boxes, emergency vehicle command stations, under-cabinet kitchen lighting, or any interior situation where additional lighting is required. Available as part of an OEM installation or as a retrofit. White illumination offers clear visibility during daytime hours. At night, blue and red illumination offers numerous additional advantages; especially in the reduction of night-blindness which is the time it takes for the eye to adapt when transitioning between light and dark. Luma Bar has developed both a blue/white and a red/white combination LED lighting system that provides superior versatility for both day and night compartment lighting applications. This innovative lighting system offers the benefits of both color options at the flick of a switch and is Luma Bar's most versatile compartment lighting option. Available as both our Integral (integrated within the side frame of your AMDOR Roll-Up Door) or Stand Alone lighting systems. This innovation has both color LEDs on one board providing the versatility of switching between either blue/white or red/white illumination, which can be used for numerous OEM and retrofit applications. Studies have proven that red light has significantly less adverse impact on night vision compared to white lighting. The retina differentiates visual inputs and sends information to the brain. Within the visible spectrum red has the lowest frequency and helps preserve your night vision as it is the least likely to over-stimulate the receptors within your eye allowing the pupils to remain dilated when visually transitioning between the illuminated area and darkness. When operating within the red spectrum vs white we experience a faster adaption time between light and dark resulting in a safer operating environment. The color red is often associated with safety and emergency vehicles, subsequently red lights provide a number of additional safety features. Aside from the safety of those working around the illuminated area, red LED lights are less obtrusive to those driving at night, especially in a road-side situation where there may be active traffic operating. Red lighting also provides the best ability to see detailed information such as labeling on a pump panel, instrument settings, gauges, etc. compared to other colors at night.